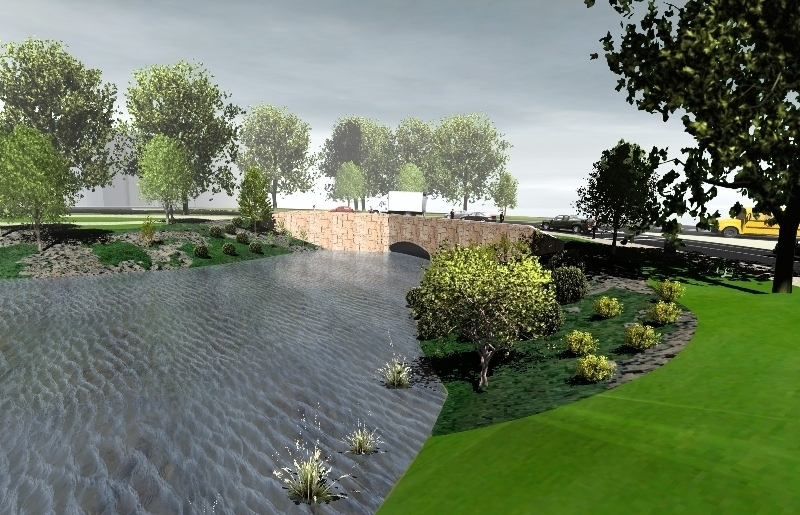 The weather last several weeks hasn’t been as dry since the last update; however, we have continued to make progress on the project between rain storms. 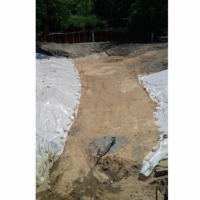 At the Upper Fens Pond (UFP) work area, all the sediment has been removed and the stone protection at the toe of the banks have been installed. 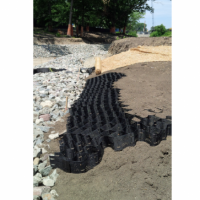 We have begun placing geocells on the upland portion of bank with new loam and turf reinforcement mattress to restore the banks. 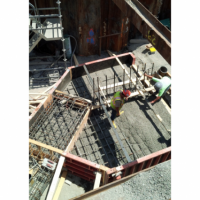 At Avenue Louis Pasteur (ALP), we have begun installing the steel sheeting support of excavation upstream of the culvert so that we may begin that portion of work to construct an extension piece of precast concrete culvert to the existing ALP culvert. 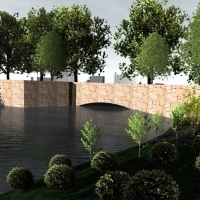 This extension piece will allow us to “daylight” the river in the area between Upper Fens Pond and Avenue Louis Pasteur. 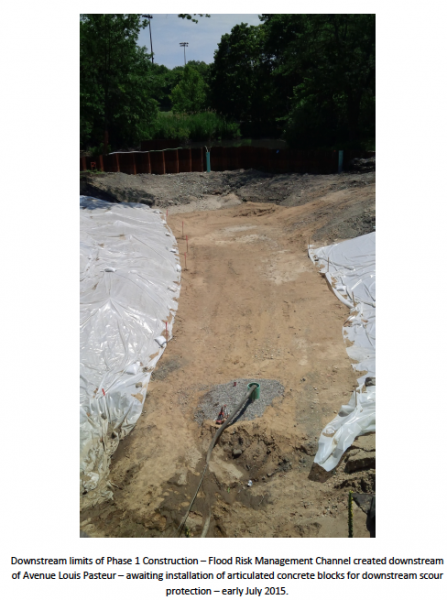 At the Riverway Culvert work area, we are placing concrete for the pile caps and will soon be placing concrete for the invert slab. 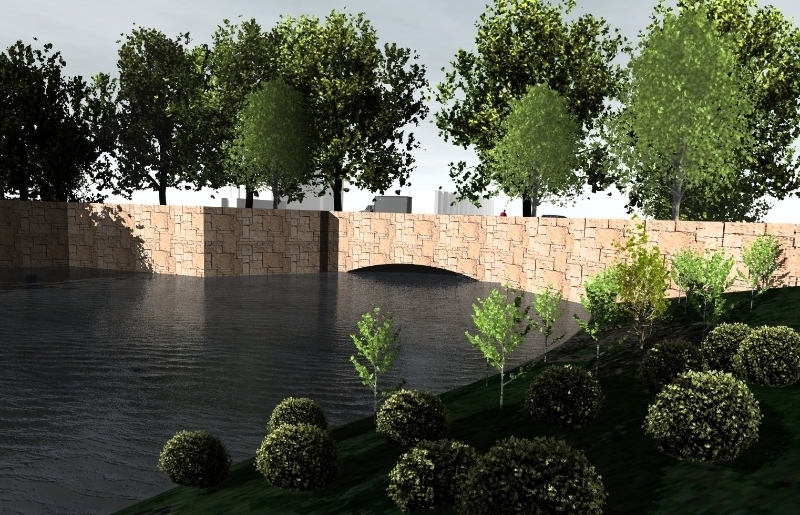 Once that occurs, we will be installing the precast concrete culverts, which are anticipated to be installed late July/early August. 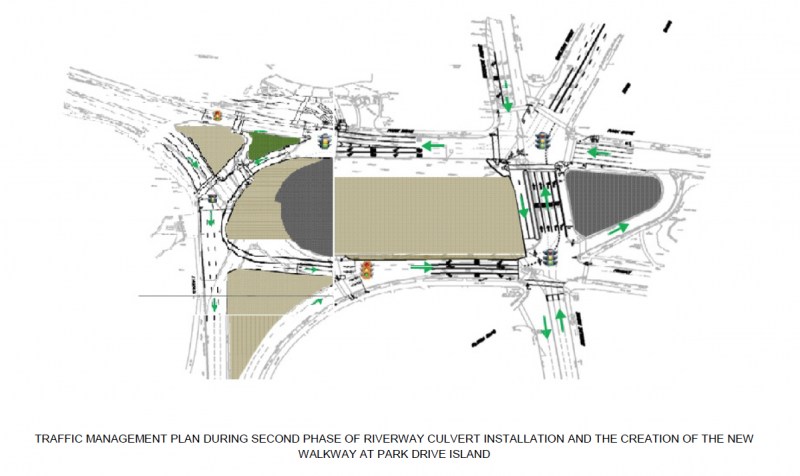 Once that happens, “daylighting” activities at the former Sears Parking Lot may begin as early as August. Thank you for your continued interest and support for this project! 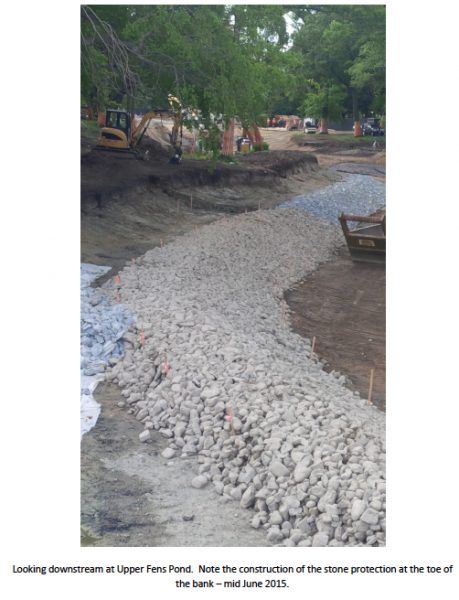 In order to continue the work on the Riverway Culvert, a traffic shift was performed on April 25 and 26, 2015. 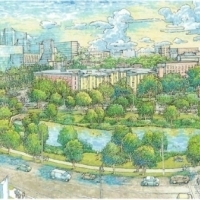 This traffic shift maintained the current traffic pattern around the former Sears Parking Lot at Park Drive, between the Landmark Center and the Riverway Connector, but funneled the three lanes of traffic down to two lanes as it rounds the former Sears Parking Lot and connects with the Riverway Connector. 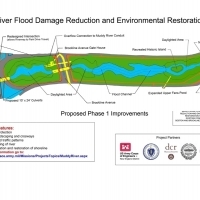 In addition, Brookline Avenue was opened back up to two-way traffic to alleviate any potential congestion caused by the Park Drive lane reductions. The current traffic pattern can be seen in the figure shown below. 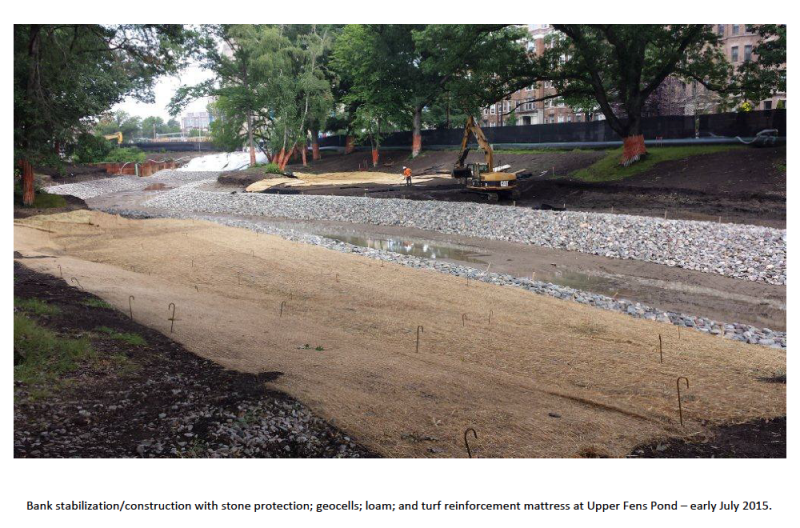 In the Riverway Culvert work area, since the traffic move, the contractor has completed the installation of steel pipe piles and began tying steel and installing formwork. Concrete placement has started for the pile caps and will continue to the invert slab; and wing walls. 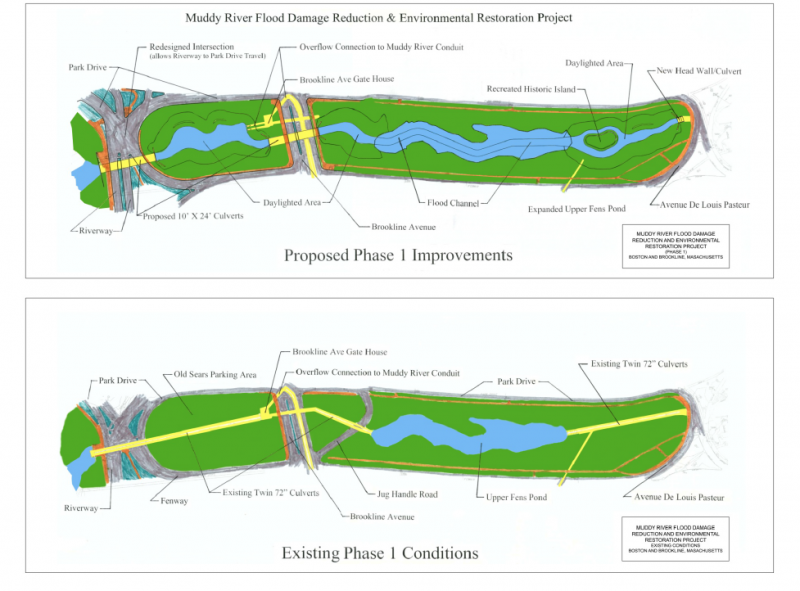 Culverts are anticipated to be installed late July/early August. 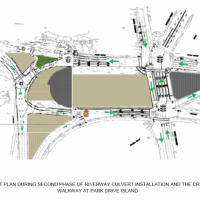 A continuing activity in the next couple of months, in the area around the former Sears Parking Lot (Park Drive Island, near Brookline Avenue), is the installation of conduits and foundations for the end condition roadway lighting, which may result in occasional lane closures. 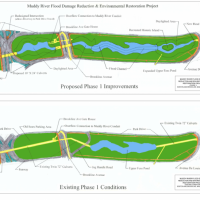 Beginning mid July, the contractor will begin to install the Flow Restriction Control Structure (FRCS) upstream of the existing Riverway Intake Structure at the Phase 1 Construction project limits. 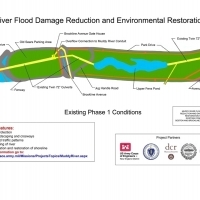 The FRCS is necessary to control the increased flow that may now be passed through the new precast concrete culverts at Riverway and Brookline Avenue. 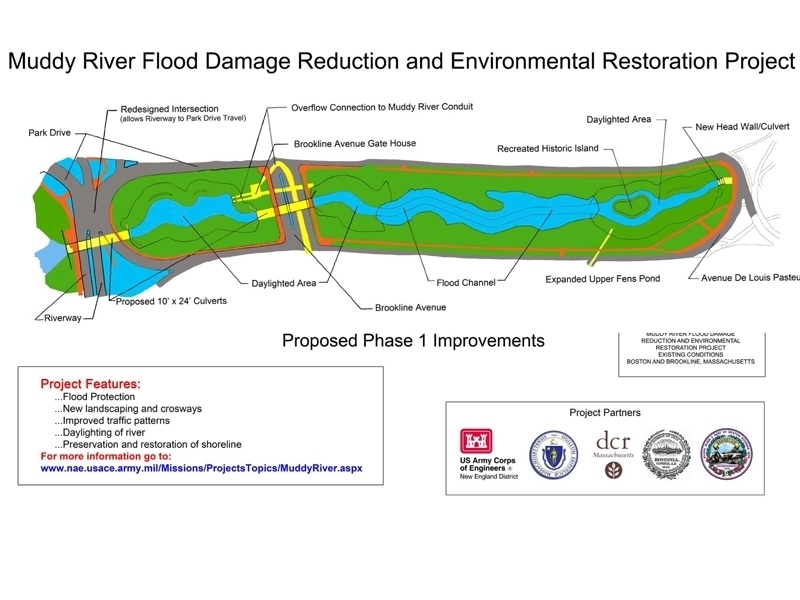 However, these increased flows are not able to be passed downstream of Avenue Louis Pasteur to the Charles River until the dredging is completed under Phase 2 work. 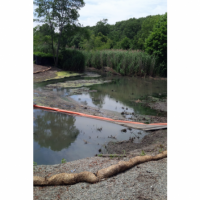 In anticipation of the FRCS being installed, phragmites in the area upstream of the existing Riverway Intake Structure haven been removed. 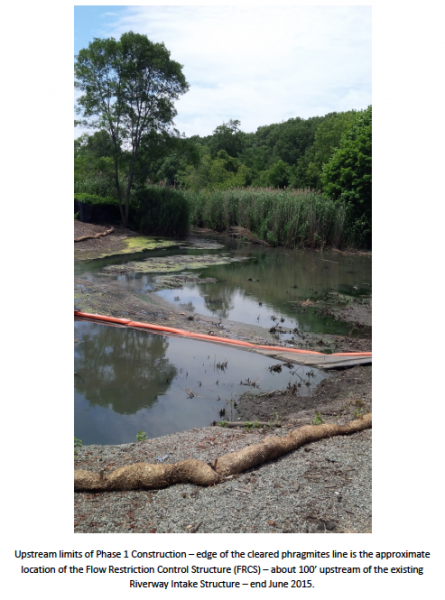 A concurrent activity to the Riverway culvert and end condition roadway lighting work is the sediment removal and bank restoration/stabilization of the Upper Fens Pond. 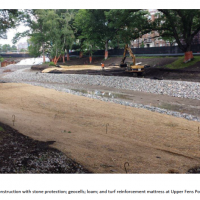 Since the active diversion of the river began in mid-April, the removal of the sediment in the river bottom to construct the new flood risk management channel; and the bank restoration/stabilization on both sides of the channel with stone protection in the Upper Fens Pond has been completed. 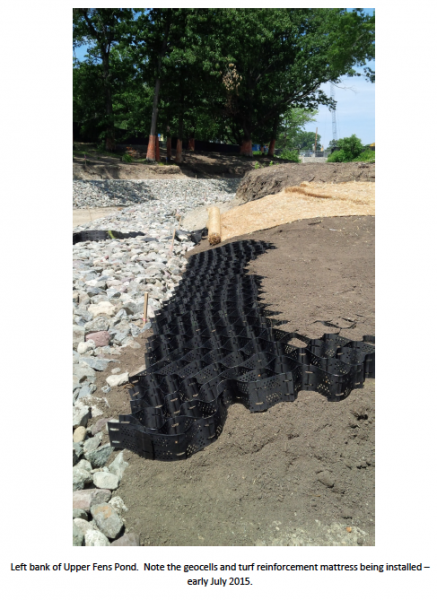 Currently, the contractor is installing geocells on the upland part of the channel. Bank construction will continue into August. 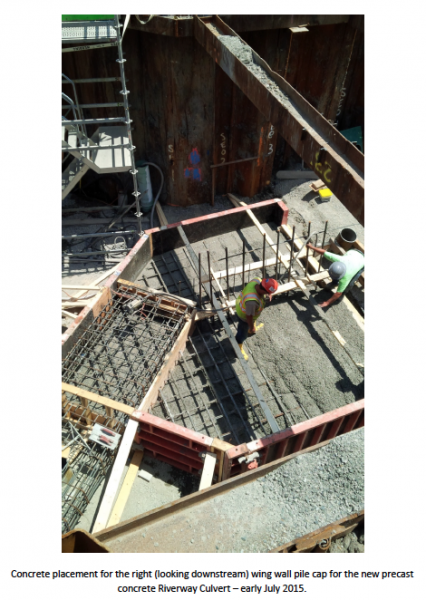 In addition, the contractor began installing the steel sheeting support of excavation upstream of Avenue Louis Pasteur (ALP) early July. 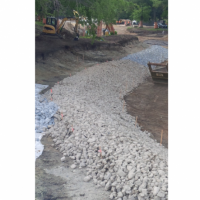 This will allow the construction of the extension piece of the precast concrete culvert upstream of the existing ALP culvert. 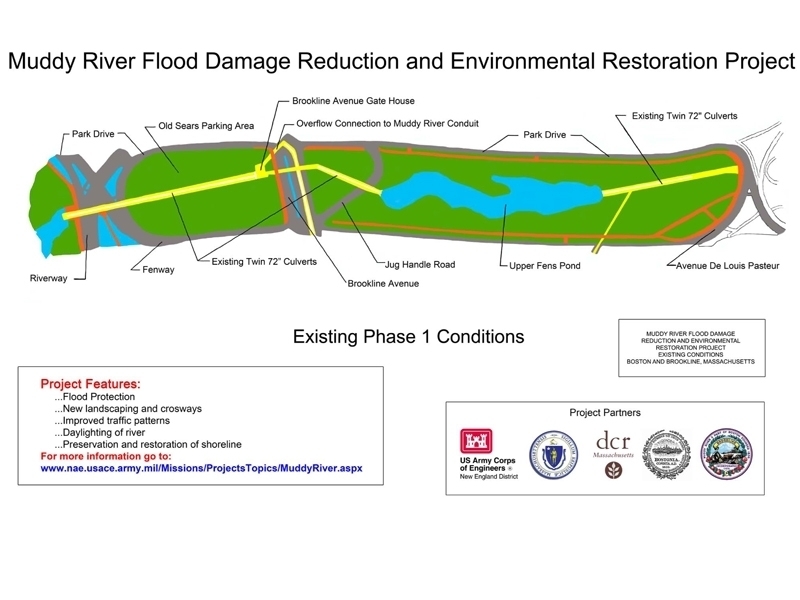 Once the extension piece of precast concrete culvert is in place, then the section of existing culvert between the Upper Fens Pond and Avenue Louis Pasteur will be removed and the river “daylighted” to continue the flood risk management channel and the recreation of the historic Olmstead island. 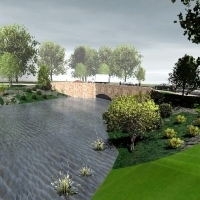 The construction activities in this phase of work are expected to continue into Fall. Downstream of Avenue Louis Pasteur, the contractor has removed the sediment from the outlet of the existing culvert to construct the new Flood Risk Management channel and will soon be installing the articulated concrete blocks for scour protection; and stone protection and geocells for bank stabilization at this downstream end of Phase 1 Construction. 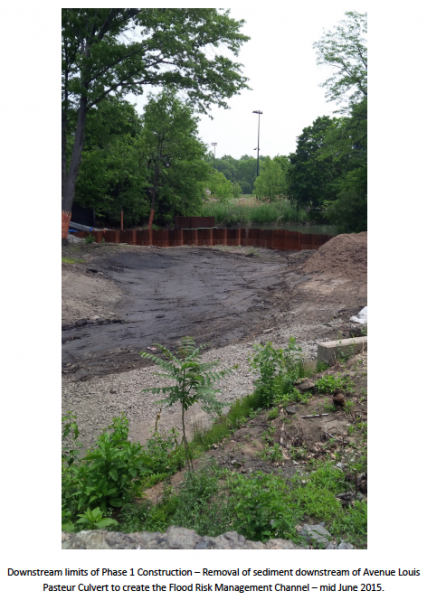 At the end of this notice we have included some pictures that show the construction progress in the Riverway Intake Structure; Riverway Culvert; the Upper Fens Pond; and Avenue Louis Pasteur work areas. We thought folks would be interested in seeing the work occurring behind the fence.